When fielded, search your bag for up to 2 Sidekick dice and roll them. Global: Pay . Move up to 2 Sidekick dice from your used pile to your prep area. Characters with “Draw Dice” effects are triggered when the requirement of the card effect is met. 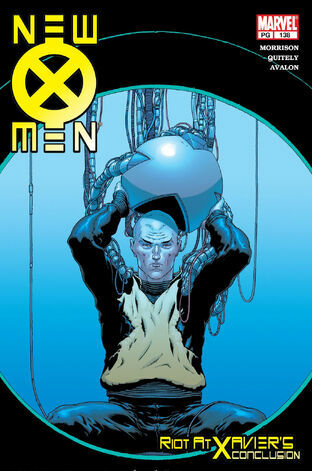 In the case of Professor X: Recruiting Young Mutants, this is when this character is fielded. Since fielding Professor X would occur during the Main Step (which happens after the Roll and Reroll Step), dice rolled using Professor X’s effect cannot be rerolled. If there are no dice in your bag when you need to draw new dice, immediately refill the bag with the dice in your Used Pile. Professor X's Global (PXG) may be used as many times as possible provided the energy cost is paid and there are legal targets. If there were 8 Sidekick Dice in the Used Pile, one could pay 4 and move all of them to the Prep Area. If, on a player's turn, a on a Sidekick die is used to pay for PXG, that Sidekick die may not be selected to move to the Prep Area. A Sidekick face cannot be used to PXG itself. When the Global is used during the player's turn, the spent energy goes out of play. When the Global is used on the opponent's turn, the spent energy goes to the Used Pile and is eligible to be moved to the Prep Area if PXG is used again. Jinzo: Trap Destroyer: While this monster is active, your opponent must pay 2 life to use an action die or global ability. Professor X: Powerful Telepath: While Professor X is active, your opponent cannot use actions or global abilities. He or she can pay 2 life to prevent this effect for the rest of the turn. Wasp: Founding Avenger: While Wasp is active, when your opponent uses a Global Ability, she deals them 1 damage. ^ Professor X: Recruiting Young MutantsWizkids Rules Forum[/url]. Wizkids.com. Retrieved 8-4-2015. ^ Mythos:X-Men Vol 2006 1. Marvel.com. Retrieved 12 September 2016. ^ New X-Men Vol 1 138. Marvel Wikia Database. Retrieved 26 July 2015.